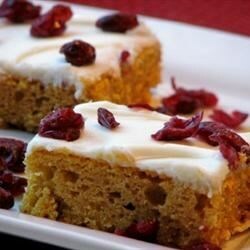 "Vanilla frosted pumpkin bars with walnuts are the best! These can also be frozen with or without the frosting, for later use." Preheat oven to 350 degrees F (175 degrees C). Butter and flour a 10x15 inch jellyroll pan. In a large bowl, cream together 3/4 cup butter and white sugar until light and fluffy. Beat in the eggs one at a time, then stir in the pumpkin. Combine the flour, baking powder, baking soda, salt, cinnamon, and nutmeg; stir into the pumpkin mixture. Mix in walnuts. Spread evenly into the prepared pan. Bake for 30 to 35 minutes in the preheated oven, or until toothpick inserted near the center comes out clean. Cool completely before frosting. In a medium bowl, mix together the cream cheese, 1/3 cup butter, and vanilla until smooth. Gradually blend in sugar, then beat until smooth. Spread over cooled pumpkin bars. Cut into squares. I made this for thanksgiving dinner and it was a huge hit. It does turn out more like a dense cake but is moist and the icing is fabulous. A nice change from the standard pumpkin pie. Save this frosting recipe! This turned out more like a spice/pumpkin cake than dense bars. I've tried it both in a 9x13 and jelly roll pan, both work out. It's a keeper. A great fall recipe or for the holidays. I have some frozen in the fridge as I type. I love how easy it is and how well it bakes. Just lovely!